I’m just going to come right out and admit it – I actually really like remasters and re-releases. I like re-playing my favorite games with better graphics and being able to get all of the achievements again. I’m part of the problem with the game industry currently and I’m the reason why companies keep releasing these things. Sorry about that. Though, to be fair, I do also own a site dedicated to singing the praises of indie games, so I’d like to think that balances things out a bit. This week’s remaster is Assassin’s Creed: The Ezio Collection, which brings the Ezio Trilogy – Assassin’s Creed II, Brotherhood, and Revelations - to PS4 and Xbox One with better visuals and all of the single-player DLC in one package. Is the Ezio Collection worth a look on Xbox One? Find out in my full review. One thing you have to remember about this collection is that, despite how cynical people were and are about Assassin’s Creed becoming an over saturated yearly release, there were fairly massive improvements made with each new entry. For example, the gameplay in Assassin’s Creed II feels surprisingly rough with awkward free running and stiff combat, but it was greatly improved in Brotherhood and again in Revelations. All three games feel fairly stiff and terrible compared to AC Unity or AC Syndicate, though, which just goes to show you how far the series has come over the years. Now, don’t take that the wrong way. I’m not saying the gameplay is bad here, it just isn’t nearly as smooth and fast and polished as the combat and platforming became in the more recent games. You can still have a lot of fun with all three games, but you’ll curse the controls and gameplay more than a time or two. Once you get into the rhythm of how things work, though, you get used to it and can have fun. 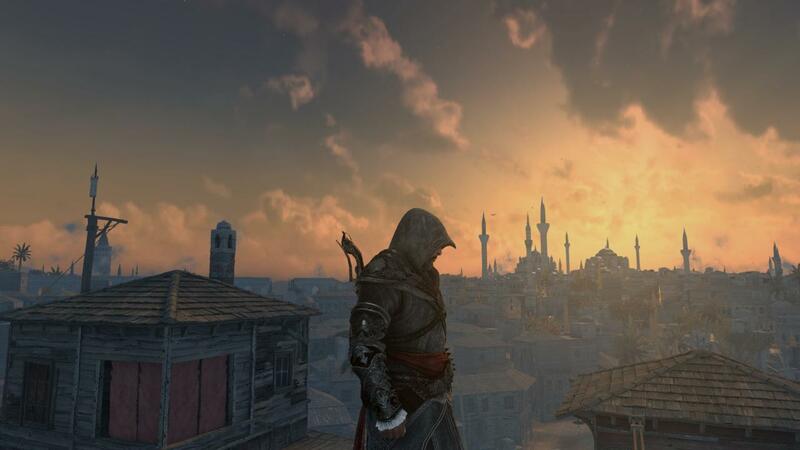 The core gameplay foundation of running across rooftops and assassinating fools has always been fun and some of the best set pieces and scenarios in the whole franchise are found in these three games. You can also see the evolution of the series in the improvement of the visuals in the three games in the collection. ACII looks somewhat simple and rough while Revelations actually looks fairly decent. As far as graphical improvements for this remaster go, the draw distance is greatly increased and the textures on the environments have much more detail now in HD which makes the games look pretty impressive even today. For whatever reason, however, the faces of characters look pretty bad. The eyes in particular are just bulgry and the white part of the eyes is too bright white and terrible looking, which makes the cutscenes look awful. During gameplay the games generally look fine, just don’t get too close to anyone and look at their face. I can’t talk about the visuals without bringing up that notorious glitch video that came out right when the Ezio Collection first released that showed an NPC with a blank stare and particularly awful looking face. Everyone posted that and has acted like that is what the game looks like all the time, but that isn’t true at all. That particular NPC was a one in a million glitch where the facial texture didn’t load right and most people won’t actually see that same scene when they play the game. I certainly didn’t. This whole controversy was blown out of proportion and is not representative of what you see in the game. Are the faces kinda ugly? Oh heck yeah. But nothing I have seen in the three games is anywhere close to as bad as that glitch video makes it seem and the coverage of it afterwards can only be deemed irresponsible and misleading. Yeah, take that, other video game websites. 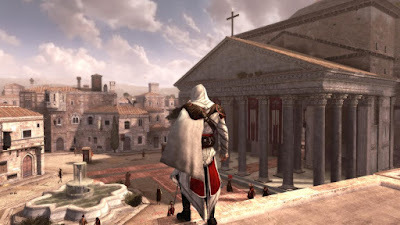 The Ezio Colleciton includes all three full single-player experiences from the original games along with all of the single-player DLC, but the multiplayer components of Brotherhood and Revelations are not present here. There are also two short films that fill in storyline gaps included as well. This is all only really noteworthy when considering the overall value of the collection. For $60 you’re getting easily 50-hours or more of gameplay, which is pretty hard to argue with. Of course, all of these remasters ultimately come down to what you expect from them. If you think it’s dumb to pay $60 for games you can buy for a fraction of the price on last-gen, it obviously isn’t for you. 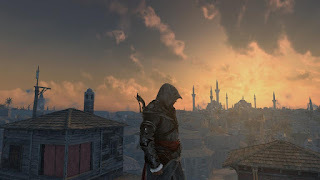 If, on the other hand, you’re excited about playing them with better graphics and want to get the achievements again (yeah, I still like achievements), you’re getting a lot of bang for your buck with Assassin’s Creed: The Ezio Collection and it is worth a look. Disclosure: A review copy was provided by Ubisoft.